If you've been blogging for a while now, you probably must be interested in the idea of having your own custom domain. If the answer to the above statement is yes, you might be a might scratching your head, wondering how to go about it. 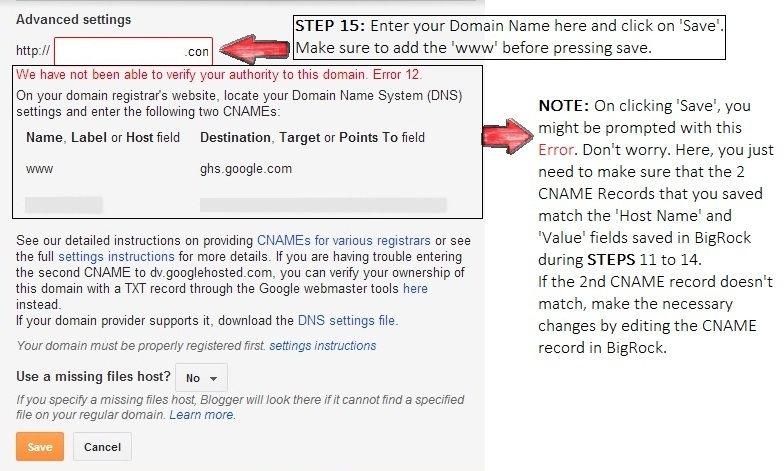 Well, if you've purchased a domain name from BigRock and have been hosting your blog on Google’s Blogger, here is a detailed step by step guide to add a BigRock domain name to your Blogger account. Since this guide takes into consideration the minutest of details, don’t get scared on seeing a long list of steps. Once you’re on it, you’ll find yourself at ease, going through each one of them in a jiffy. Moreover, each step has an image (my sincerest apologies for low resolution images. As an interim solution, you can click on the image and enlarge) to go along with them so that you are not clicking buttons by guesswork. 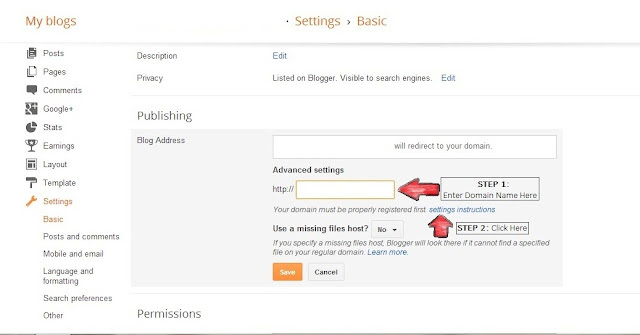 Before we begin, Navigate through your Blogger’s Dashboard: Settings » Basic. In the Basic tab, scroll to ‘Publishing’ section and click ‘+ Add a custom domain’. STEP 1: Enter your desired domain name. Don’t forget to add a ‘www’ before entering your domain name. STEP 2: Click on ‘settings instruction’ as shown in the image below. STEP 3: Choose the ‘Top-Level’ domain option and keep this page open for further reference. STEP 4: Head over to your BigRock account by signing in. Here, you’ll see a list of all the domain names that you've purchased. Click on the one you want to link to your Blogger account. STEP 5 and 6: On the right hand side of the page, you’ll find another Dashboard. Here, click on ‘DNS Management’. As directed by the image below, click on ‘Manage DNS’ section to open a new window. STEP 7: By default, you’ll be in the ‘A Record’ Section. Click on ‘Add A Record’ button. Though adding A records is optional, it is highly recommended that you add all A records so that people who visit your blog by typing ‘your_blog_name.com’ instead of ‘www.your_blog_name.com’ don’t get an error message. 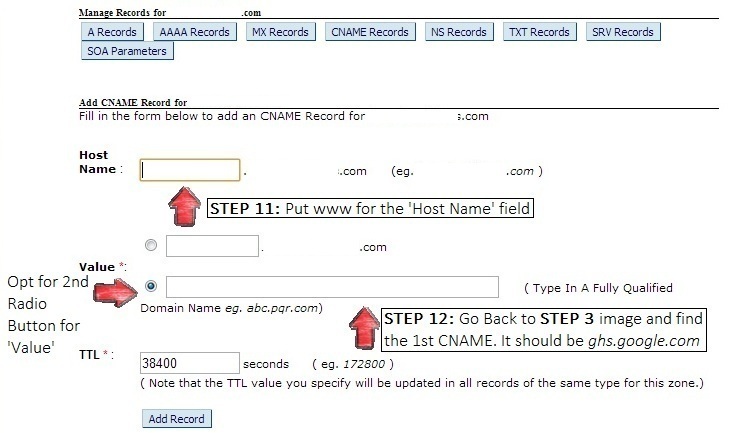 STEP 8: While adding a new A record, leave Host Name blank. Go back to STEP 3 or the page that was kept open for reference. It’ll be required here. In the page open for reference, you will find 4 IP addresses. Add these one by one to Destination IPv4 Address, leave all TTL values default and click the SAVE button. This means, you will be adding 4 ‘A Records’ to your BigRock account. STEP 9 and 10: Follow the instructions on the image given below. 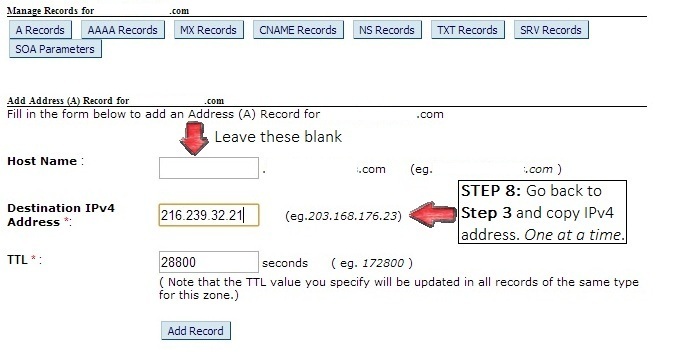 Click on ‘CNAME Records’ and add new CNAME Record by clicking ‘Add CNAME Record’. STEP 11 and 12: These are the tricky steps. Make sure you follow correctly to avoid any problems later on. For the ‘Host Name’, insert the value ‘www’ (without the apostrophes). For the ‘Value’ field, choose the 2nd radio button and open the reference page. Here, you will find the 1st value of your CNAME Record. Typically, it should be ghs.google.com. However, to be on the safer side, confirm the value from your reference page from STEP 3. Enter this value in the required field and click SAVE. STEP 13 and 14: Add your 2nd CNAME record by following STEP 10. Go back to your reference page obtained from STEP 3 and find the ‘Host Name’ and its corresponding ‘VALUE’ for your 2nd record. To find these, refer to the image below. Text written in red is the Host Name and its corresponding value is in blue. Once you've entered these values, Click SAVE and head over to your Blogger settings. STEP 15: Go to Settings » Basic » Publishing and add your domain name and Click ‘Save’. If you’re prompted with an error, don’t panic. It is completely normal and now is when you need to show a bit of patience. As for the Error, refer to the note in the image below. Upon receiving the error, Google will display the CNAME’s Host Name and their corresponding Values. 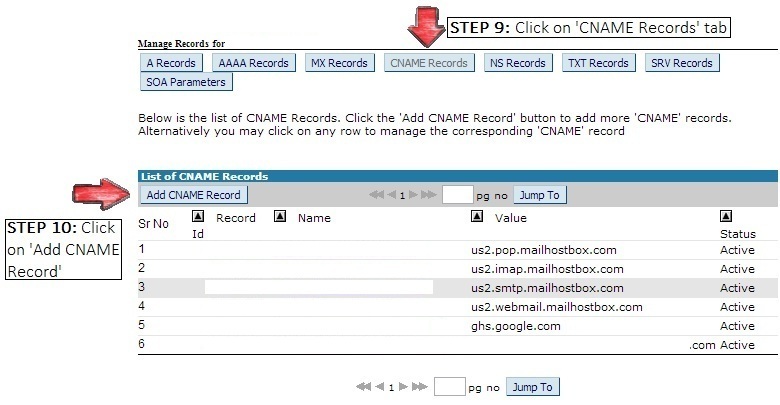 Make sure these match with the CNAME Records that you’ve just saved with BigRock. If they are same, rest assured that all the details that you’ve entered are correct and go crazy repeating STEP 15. Usually it takes Blogger an hour to detect and make the necessary changes. In some rare cases, it may take up to 48 hours. However, if these values are different, in the CNAME Record tab, click on the value that has discrepancy and make necessary changes by clicking the ‘Modify Record’ button. Should you run into any problems, feel free to write a comment below and I promise to be nice and answer all your doubts within 24 hours! If this article helped you, be sure to +1 and share on Google+, Facebook and Twitter. You can also subscribe for more awesome stuff! P.S. - If you feel that the text in images is not readable, you can always click the images to enlarge them. Vinamra, I am going through this now. Helpful breakdown!....but I asked one of my close blogging buddies to handle it for me lol....thanks for sharing though dude! I'm sure this will come in handy whenever you plan to do it yourself! i did everything right just like you told me too but it stil showing me error 13 i dont know wat the problem is. please help! It would be helpful to know when do you get this error? I'm Providing correct information but having this Error We have not been able to verify your authority to this domain. Error 12. I can't understand what the problem. Please Help ! If you're sure you've done everything correctly, don't worry, this verification takes time. You just have to write www for step 11 and go back to step 3 to conform what to write in the value field. If you can specify the exact problem you're facing, I might be able to help you better. I am able to view the website from my laptop (Chrome). I'm glad this article helped you! WOW, this is a fantastic blog post, I must appreciate your hard works, please do write a blog post for adding domain name to host gator. I moved back to blogger after years on WordPress writing my short stories and poems there, I came just because of free domain mapping as its totally unfair to charge for it, we pay for domains don't we? I got the error message which remained intact till 24 hours and saw your article then. Only difference was that I had kept the ghs.google.com in the field corresponding to "value" instead of its second row. Since you've written it pretty well, I'm hoping to get pass in the next few hours. And its working in 10 minutes. Hell a lot of thnx, you explained like a pro "CHEERS"
Glad to hear that you got it working and the guide helped. getting error in step9 and 10 : Error Message: A,NS,MX,AAAA record Exists having same name. Please Check For Record Conflicts. 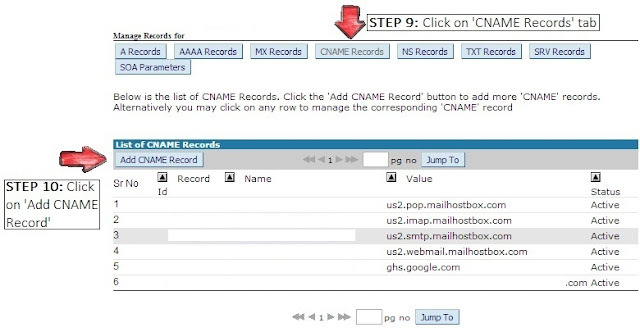 Steps 9 and 10 are just clicking on buttons to add a CNAME record. Do you mean steps 11 and 12? If yes, don't worry and be patient. Like I've said, they are a bit tricky. Make sure you're putting www in the host name and for the values field, you select the 2nd radio button and you're adding the correct name from your reference page. If you're still stuck, please send an email with screenshots/scree recording of what you're trying to do and I can try to diagnose the problem. Essentially, steps 9 and 10 are just clicking buttons to add a new CNAME record. You do not have to make any changes to AAAA, NS or MX records. I hope that helps and if it didn't, feel free to shoot me an email. sir my server i lost in between and then activates again.. its ind of fluctuating what's the problem , plz mail me.. This article is about domain names. You might need to get in touch with your hosting service provider. Hope that answered your question.